Every budget can either have the status Open, Rejected, or Approved. You can define your own budget status in the InLoox Options. Open and Approved budgets are defined as budget relevant by default. Budgets with the status Rejected are defined as budget neutral. 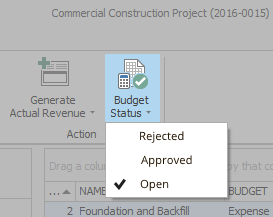 This means, that only open and approved budgets will be used for the calculations of project budgets and will be shown in budget reports or the budget overview. Manage the budget status | InLoox 9 for Outlook • Copyright 1999-2019 © InLoox, Inc. All rights reserved.